"The coatings have been working perfectly! They have opened up the possibilities of making intricate metal pieces chemically inert to allow us to transport electronically excited gases. In the past, we were limited to using brittle quartz tubes and fittings; now we can use all Silcosteel coated stainless steel parts." 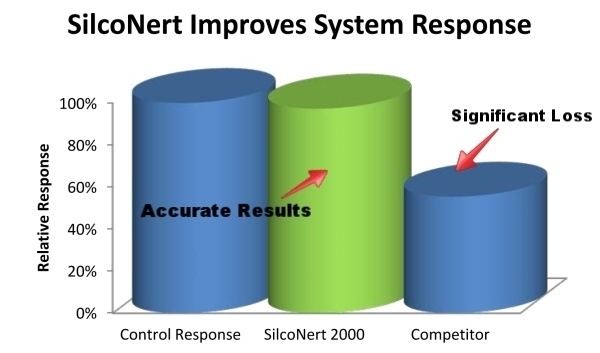 How Inert coatings improve sampling reliability. Continuous emission monitoring systems (CEMS) and sorbent tube samplers are often degraded or compromised by the loss of mercury species and ammonia on reactive sampling surfaces. Reactions and adsorption on inner surfaces of transfer and monitoring equipment cause significant failures in system reliability. An inert flow path will prevent stainless steel surface interaction with active and reactive compounds during sampling and transfer. Even under extreme conditions found in stack, refinery, flare and downhole environments, SilcoTek® coatings significantly improve ammonia and mercury sampling response.